A thematic exhibit with a lot of historical research to back it up, "Stalin" shows how the dictator's portrayal on the stamps, covers, FDCs, postcards and patriotic covers of the Soviet Union and other countries changed according to ideology and the politics of the moment. Almost all of the Stalin-related stamps issued around the world are shown here. I. Rising to power: 1926-40. 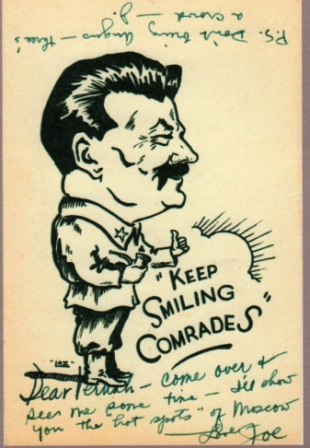 After reaching absolute power in 1929-34, Stalin allowed his image and name to be widely used in domestic propaganda, including postcards, while the use of his likeness on Soviet stamps was very limited. - II.l. In 1939-1941, after Stalin signed a pact with Hitler and attacked Finland, he was perceived in Western Europe as an aggressor, as illustrated by caricatures on postcards. - II.2. After June 1941, when the Germans invaded the USSR, Stalin appeared as the national leader on Soviet postal stationery and some stamps. - II.3. In the USA and other Allied countries, Stalin's likeness and name came to symbolize the major Ally. The triumvirate ofFDR, Churchill, and Stalin represented the symbol of victory throughout the world. - II.4. The Axis countries used caricatures of Stalin in their propaganda. - III.1. After the onset of the Cold War, Stalin's name in the West came to symbolize dictatorship and aggression. III.2. For the left, Stalin remained the hero of the war and the leader of world Communist movement. IV. Cult of Stalin in socialist countries, 1945-1956. After the war, Stalin and his name appeared as a figure of utmost authority and the symbol of official ideology on stamps and covers of the USSR and its satellites. The cult reached its apogee during the celebration of Stalin's 70th birthday in 1949. V. Stalinist countries. Three countries became the most consistent followers of Stalinist ideology even after the denunciation of Stalin's crimes by Khrushchev in 1956.Stalinist countries. Three countries became the most consistent followers of Stalinist ideology even after the denunciation of Stalin's crimes by Khrushchev in 1956. VI. Stalin in philately in the post-communist world.